How often do you see L'Oreal lipsticks on my blog? Rarely. Apart from hair colors (more than 50 of them, I think), I don't often seek L'Oreal makeup. The biggest reason for that is because L'Oreal a little bit more pricey compared to other drugstore brands, especially here in the UK. A gel liner costs almost a 1000 rupees! So the other day I went to Superdrug specially to get a Glam Shine Balmy Gloss, but as always, I was 'forced' to get 3 products to make use of the 3 for 2 offer (meaning: I get 3, but pay for only 2). L’Oreal Paris Glam Shine Balmy Gloss Die For Guava ~ I picked this one from 6 shades (see all shades here). Die For Guava is a lilac pink. The texture is buttery, and this shade needs to be layered a few times to look somewhat opaque. For now, I'd say it's most similar to Bourjois Color Boost. It is fragrance-free. Price: £6.99 | Rs.694. They cost Rs.400 in India. In the case of 3 for 2, I got this one for free, coz it's the cheapest. L’Oreal Paris Rouge Caresse Lipstick #04 Rose Mademoiselle ~ These are similar to Revlon Lip Butters, but still very different. I'd say these are more lightweight & feel less creamy/buttery. 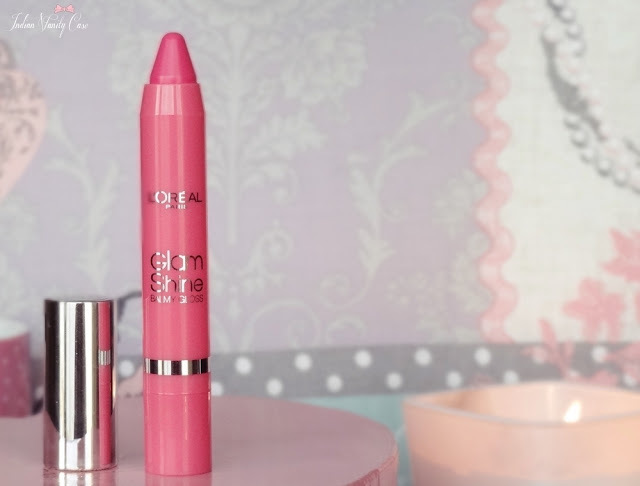 Pink Mademoiselle is simply a rose pink shade. Price: £7.99 | Rs.793. Dragging a wet rag on the floor. The L"oreal lippie haull.. very nice .. I also find L'Oreal makeup a bit pricier than the other drugstore brands but I still slove them.. the Lipsticks looks so nice.. beautiful shade..!! 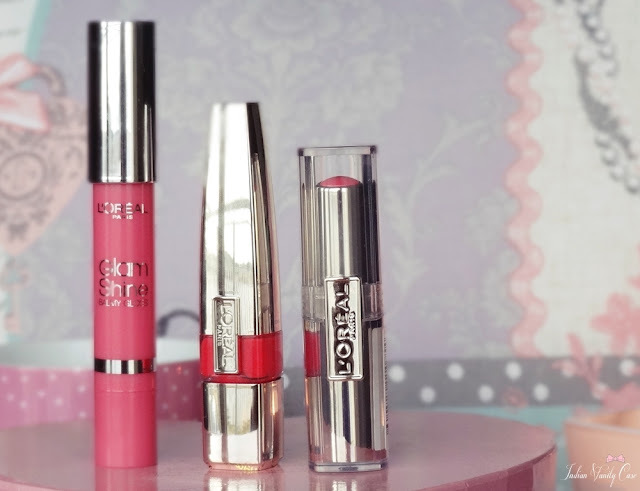 L'oreal owns YSL, so the two lip stains might be the same formulation for all we know! Omg, I've totally underestimated the color quality of the caress lipbalms! I love that shade, such a nice sheen and rose!! I would wear that with everything! I wanna try the Glam Shine Balmy Gloss,its cute and I have not yet used any type of that product,i mean those Crayon looking things,I wanna try them all. Loved Die for Guava :) Will go get mine right away!